They used a VERY long rope to free him. One car owner in Colorado learned a valuable lesson on keeping property secure this week after an unruly visitor decided to drop by and make the most of the empty vehicle. Chances are, the owner wasn't too pleased with how he left things. The Jefferson County Sheriff's Office posted about the (unfortunately) not-too-unusual incident involving an opportunistic bear, hoping others take note. 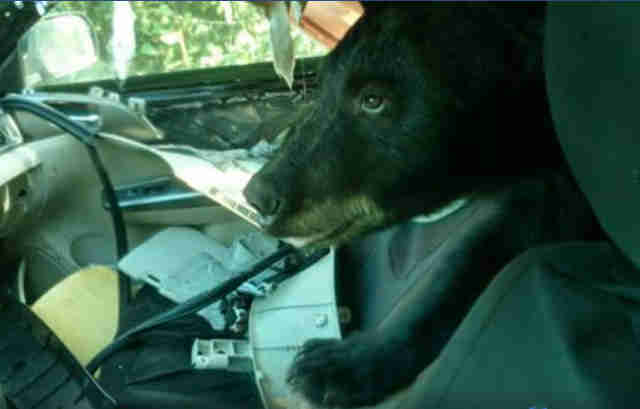 "We’ve often warned that leaving your car unlocked makes it easier for thieves to steal items, but, as we’ve now seen twice this past week, it also makes it easier for bears to climb in and make themselves at home," officials wrote online. It was far from a clean getaway for this particular bear. After entering the car, he helped himself to some snacks the owner had left behind, accidentally closing the door behind him in the process. Unable to escape, he reportedly took a nap. Afterward, the interior of the vehicle didn't look pretty, so the owner has good reason to be upset. But the outcome isn't so great for the bear, either. Now that he knows how good human food tastes, he may be tempted to try again — and that could lead to a conflict that doesn't end so peacefully for him. "Please be safe and lock your cars."